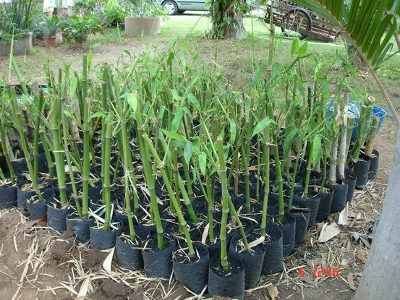 Bamboo propagation by cuttings is an effective way to establish a stand. Bamboo has been used for generations for a whole assortment of practical functions (food, building, tools), and new uses are still being found for this versatile and sustainable resource (clothing, paper, biofuel). There are literally THOUSANDS of uses for this grass if you really start exploring, which is why it can make an excellent addition in permaculture planning (designing sustainability into any property)! Yes! Bamboo is technically a grass. It is in the Poaceae plant family, it has a hollow circular stem, with some varieties reaching 100ft tall! Bamboo is also one of the fastest growing plants in the world, and a good plant for beginners to propagate. There are a few different methods used for bamboo propagation, today I am focusing on using cuttings. Using cuttings is a quick, easy, less labor-intensive way of propagating your bamboo. As with any propagation we want to use clean, sanitized tools. It helps to think of this process almost like performing plant surgery. When we cut our plant we are exposing it to any contaminants or pests in our environment, which can lead to an unhealthy plant or unsuccessful propagation. So, use clean, sanitized, sharp tools. First you want to select the bamboo culm (the main stalk or trunk from which the branches and leaves grow from) you would like to reproduce. Choose a healthy (no discoloration or major imperfections) piece that is 1-2 years old and no less than 1 inch in diameter. After you have chosen the bamboo you wish to propagate, starting from the ground count four nodes up (nodes are the hardened circles that go around the bamboo), and cut the bamboo in between nodes four and five. Next, starting at the top of the bamboo, cut where the bamboo reaches a 1inch diameter. So you should be left with a piece of bamboo that is thicker at the bottom, and as you move up, gets no thinner than 1 inch. Now, cut your bamboo culm into pieces, each with 3-4 nodes. Again, you want clean, sharp cuts and preferably on a 45 degree angle. Depending on how tall your original bamboo culm was, how many pieces you get will vary. You want no less than three pieces, with 3-4 nodes each. The next step is planting your cuttings. 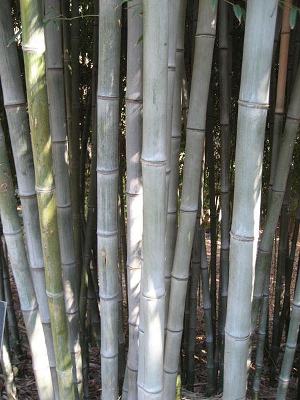 Before putting your bamboo in soil, it is helpful to apply rooting hormone for quicker results. On the opposite end or the standing end, apply a small amount of wax (I like to use soy wax or beeswax) to protect the freshly exposed cut. Make sure to leave the hole in the center of the cut open, and only apply wax along the rim. Using planting pots (black plastic nursery pots work just fine,) bury your cuttings about one node deep in organic potting soil. Press the soil around the cutting firmly, to minimize any air pockets. Water your cuttings thoroughly (wet but not drenched) and fill the center of the cuttings with water. Place your pots in an area that does NOT get a lot direct sunlight and water them daily. The soil should stay moist but not muddy, keep water in the center of the bamboo cuttings mostly full. You should start to see new growth in 3-4 weeks and you can transplant your cuttings to the ground in about 4 months. That is it! Bamboo propagation is simple, low maintenance and the possibilities for bamboo are seemingly endless! Good luck! If you are in Washington State, come see a bamboo forest in the making! Here at Alderleaf Wilderness College we have an active, flourishing permaculture farm and several varieties of bamboo we are growing for edible, building and ornamental purposes. Hope to see you soon! 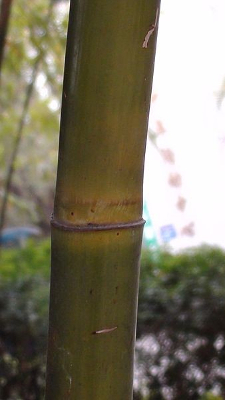 Learn more about bamboo propagation at the Temperate Climate Permaculture website. Learn all about sustainability skills like bamboo propagation at our Permaculture Courses. Return from Bamboo Propagation back to Permaculture Articles.